Smooth and easy to drink but with a substantial wallop of caffeine, cold brew coffee is attracting new drinkers and converting old ones with its low level of bitterness and acidity and subtle sweetness. “It’s all the rage,” says Richard Chanofsky, GM of the Hotel Phillips in Kansas City, Mo., which is introducing a new coffee shop named Kilo Charlie in late December that will feature nitro cold brew on tap. “We wanted something that had a bit of an edge,” he added. Cold brew coffee is, indeed, both all the rage, with a bit of an edge. According to menu research firm Datassential, it’s only mentioned on 2 percent of menus these days, but those mentions have grown by 529 percent in the past four years. Cold brew is simple, if time-consuming, to prepare: Ground coffee is steeped in cold water for 16 hours or more and then strained. Since it’s never heated, different flavors are extracted than with a hot brew. 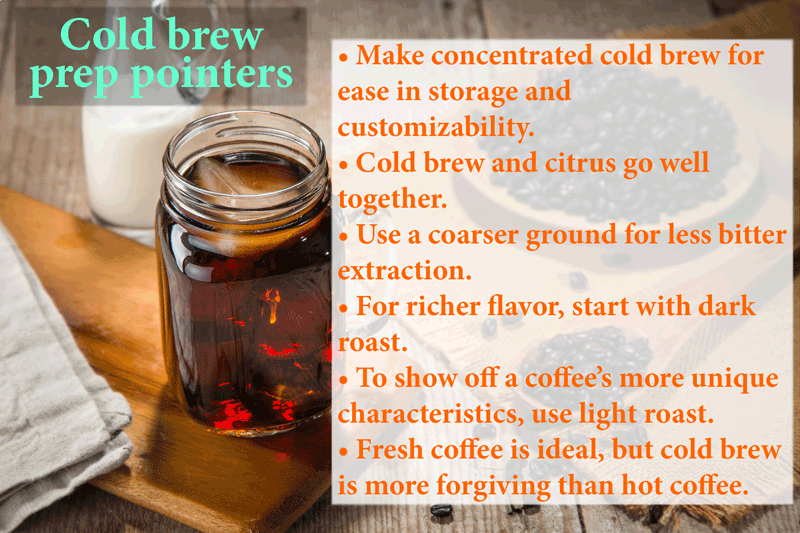 Bitter flavors tend to be left out or reduced and acid levels are lower, while chocolate-like elements are more pronounced, making cold brew seem sweeter than other coffees. Cold brew can be served sweetened or unsweetened, and increasingly it’s being served in kegs with nitrogen gas. This so-called nitro coffee can have a creamier mouthfeel and, if dispensed at high enough pressure, comes out with a head that’s sort of like stout beer. “The amount of head has to do with the pressure you use and the nitrogen faucet,” explains Matt McGinn, founder and president of Blackeye Roasting in Minneapolis, where he has two coffee shops and sells cold brew in kegs to other operators. He offers cold brew latte on draft as well, made by simply adding whole milk to cold brew in a keg. McGinn says he makes sure the refrigerated latte keg is used within seven days, “and then we have to clean our lines very regularly.” He brews the coffee at a ratio of one gallon of water to one pound of medium ground, lightly roasted coffee, which he then seeps for 16-24 hours. McGinn prefers a lighter roast because that allows extraction of that coffee’s “more unique aspects. You do a dark roast, and everything starts to taste pretty similar,” he says. For a really rich flavor, Joachim Hansen, barista at Lazy Bear in San Francisco, recommends a dark roast. He steeps his cold brew at a weight ratio of six parts water to one part coffee for 18 hours, ground at the coarsest setting on his grinder. “That way you don’t end up over-steeping the coffee,” he explains, which could result in a more bitter drink. He then sweetens it with brown sugar simple syrup and half-and-half and tops it with whipped cream sweetened with more brown sugar for a rich after-dinner drink. Lazy Bear gets its coffee fresh from a local roaster weekly, and Hansen uses the last of it for his cold brew, because he said hot coffee is more sensitive to freshness, since the bright acid and floral aromas that he wants in hot coffee dissipate more quickly. “The end product [of cold brew] isn’t going for that,” he said. Brianna Berry, coffee director and head barista at Harold’s Cabin in Charleston, S.C., makes a concentrated cold brew — about 2.5 times the normal strength, for two reasons: It takes up less storage space, and she can make it as strong or as weak as her customers like by watering it down to order. She also uses it to make other beverages, including a smoked cold brew made by setting a cinnamon stick on fire and then capturing that smoke in an inverted glass. Then she flips it over, adds ice and cold brew. She also makes a coffee-fiend’s riff on an Arnold Palmer by mixing equal amounts of cold brew and lemonade. She also has found that an orange juice-cold brew mix makes a popular breakfast drink. “Anyone who’s had a chocolate-covered orange knows that those cocoa flavors go well with the orange citrus. And oranges are kind of floral, too,” like cold brew, she says.